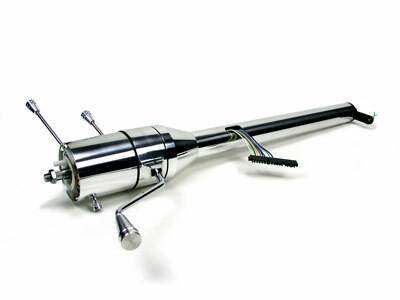 Retrofit 1947-54 Chevy Truck Tilt Column Shift Steering Column - Polished Aluminum. This retrofit column is designed to fit your Chevy Truck and does NOT require modification to your original vehicle to install. For quick installation, the 1947-54 Chevy Truck column comes complete with a new underdash mount and floor mount. Use an ididit installation kit to install your new steering column in place of the old. All of our Chevy truck column shift columns come complete with a neutral safety switch (shift indicator not included). The shift pattern on the column allows you to use either a 3 or 4-speed automatic transmission. A shift linkage (new or original) is required for installation and will attach to the lower shift arm provided on the column. Using an adaptor, add an aftermarket wheel and the gripping surface of the new wheel will be in the same location as the original. Standard features include 8-position tilt, self-canceling turn signals, 4-way flashers, knobs & levers, 3 7/8" wiring plug, and a 1" DD lower shaft.